Eleven students and three faculty members spent their last week of winter break building houses eight hours away from Seton Hill University (SHU) in Pittsboro, NC. The trip was part of the Griffins @ Work service club. As a component of Habitat for Humanity’s Collegiate Challenge, groups, like those from SHU, spend a week with a Habitat for Humanity affiliate working to improve housing conditions for others. Assistant professor of chemistry Diana Hoover led the trip along with Assistant professor of mathematics Geoffrey Atkinson and food service director Darren Achtzehn. The trip was a first for both Hoover and Atkinson; it was the ninth trip for Achtzehn. The group worked alongside the Chatham Habitat for Humanity which built its 100th house in 2010. Chatham Habitat for Humanity serves both the towns of Pittsboro and Siler City both of which are west of Chapel Hill and Raleigh. “Everyone worked really well as a team and we worked with a lot of really fun volunteers. It couldn’t have been better,” said senior Kellie Kucera. The SHU CREW worked on several different houses doing everything from crawl space work to roofing. Workers from Chatham Habitat for Humanity, many of which were from Americorps, commented on how the SHU group was one of the best they had seen. “The group was awesome, they were at the work site early, awake and ready to go. They were special because they brought skill and with it an eager willingness to learn,” said construction site manager Jack Heuer. “It was a huge boost for us, without them we would have had a tough time meeting deadlines.” Leaders said that the work by Seton Hill students was comparable to groups twice its size. A few returning students on the trip had experience and enthusiasm that rubbed off on others. Some students even got to work alongside the future homeowners themselves. Each house had a picture and description of the family inside. “It made it real to see the family and to even work with the family,” said senior Ashley Dorry. The SHU volunteers did more on this trip than just build houses. They had some downtime as well. In the middle of the week the group got a chance to attend a Carolina Hurricanes hockey game in Raleigh. The Hurricanes played the New York Rangers and won 3-1. Dinner was prepared by different crews of students each night; however, one night the group got to enjoy dinner at the house of Lisa Volaric, a SHU alumnae. Volaric is the Director of Undergraduate Laboratories at University of North Carolina at Chapel Hill. She welcomed the SHU students for both dinner and games. “It was a great experience meeting Volaric and Dr. Hoover’s friends and learning about life after undergrad,” said senior chemistry major Holli Gonder. Students and faculty went on the trip for several different reasons. Several had heard about the stories and experiences from other Habitat trip students. Others wanted to see what it was all about. The trip was not only a success for the SHU CREW but also for Chatham Habitat for Humanity. The group helped in finishing two houses on time. “The Seton Hill crew was [a] Habitat miracle for helping us in finishing two houses on time. They were a strong group all the way,” said Heuer. 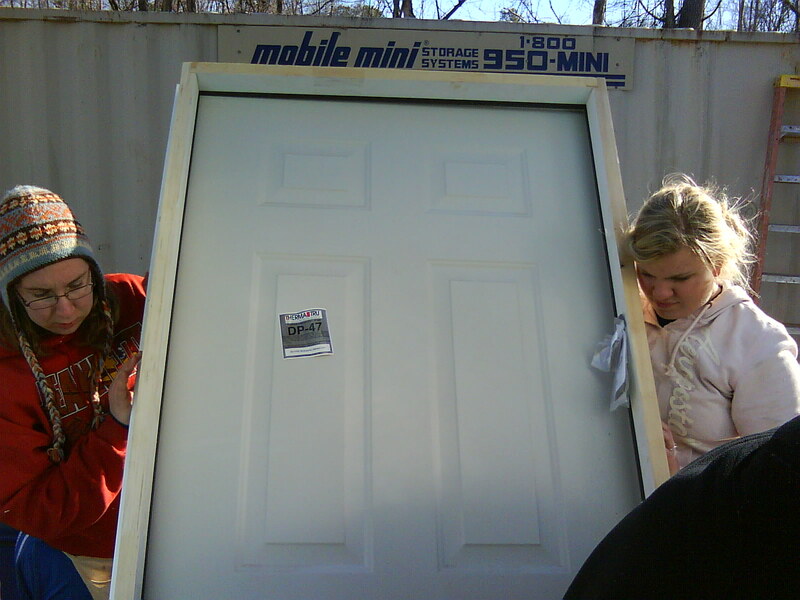 Seton Hill students Holli Gonder and Ashley Dorry work on building another house through Habitat for Humanity in Pittsboro, NC in 2011. January 27, 2011 in News.